I love my nails, but they go through phases. Sometimes they are very strong, long and indestructible. Sometimes they are quite brittle and struggling to get length. People often ask me how to keep healthy, growing nails* which can then be manicured to last. Throughout the times I noticed that caring for them properly makes a huge difference. 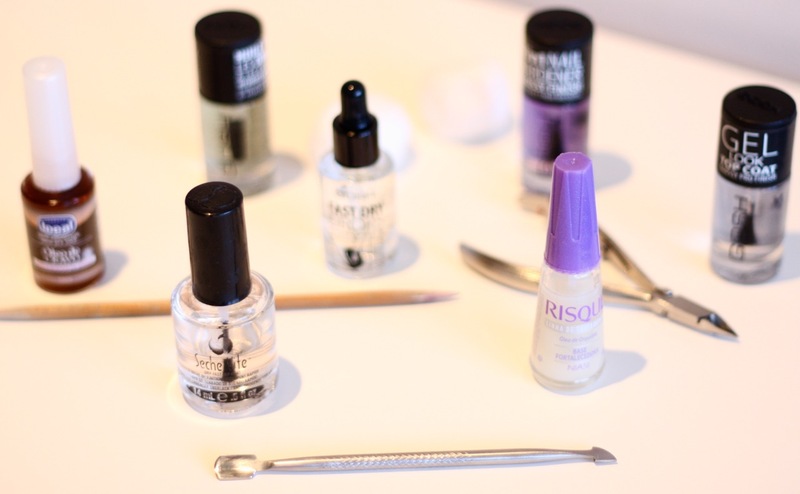 Apart from exfoliation and hand cream (check out my post on a 60-second fix), which are indispensable in my life, I have a few other nail heroes I use on a regular basis to keep my talons happy. Back to the nail cream, it is very important that, when applying you massage into the cuticles. When my cuticles are dry, the growing nail is dry and the quality goes downhill. I also use nail oils. A lot. My favourites are clove oil (I buy in Brazil), Dad’i Oil and Gelish Nourish. After removing my polish, I add a lot of oil to the whole nail and cuticles. I often leave at least a few hours (sometimes, my ideal whole day) before having the next mani. 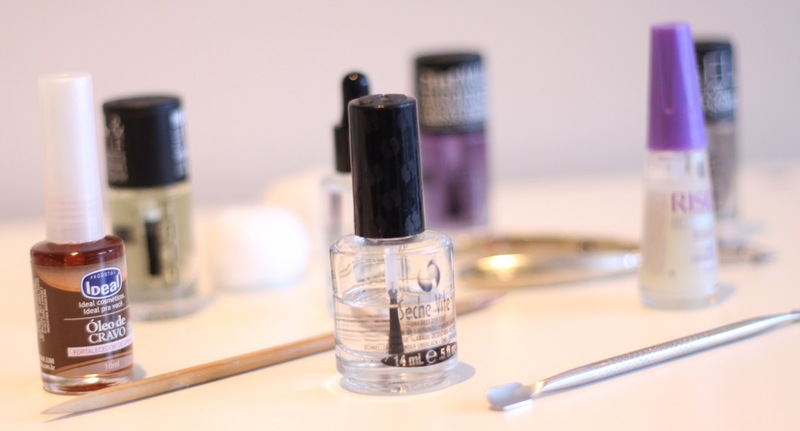 If you nails are naturally very oily, apply only to the cuticle area and rub outwards towards fingers. Filing is quite important. Be gentle and use a good file, like these ones, to avoid snags and to give them a smooth edge. I tend not to like buffer files as the nails will look lovely but it does take away layers of nail and if you keep doing it, they will turn paper thin and split. I only use buffers when I have bad ridges, peelings or breakages – last resort! I then manicure my nails. I add a blob of moisturiser to each nail’s cuticle, soak them in lukewarm soapy water and push them with a metal cuticle pusher. When pushing, be gentle not to damage the nail surface, as the soaking leaves them more delicate. You could stop there, but I actually trim my cuticles using special “pliers”. After that, I dry them and apply a good base coat. At the moment I am using Brazilian brand Risqué strengthening base coat, but I also love the OPI’s Nail Envy. Using a base coat is very important to protect your nails from the pigments on nail polish. I paint my nails, making sure my coats are not too thick; this also helps with durability. I clean and tidy the edges using a wood manicure stick, nail polish remover and cotton wool. Then I apply a topcoat. Seche Vite is my favourite, hands down. It cements the layers together, gives it a lovely shiny finish and make it durable. For real. Most weeks I can go 10 days chip free even with cheaper polishes. The new GOSH Gel Look Topcoat, launching next month, is also quite amazing and very well priced. Finally, I add some lovely drying drops; Essie’s is great and GOSH is also bringing out a great one. If you want to see the finished product (my manicures! ), you can find them all in my nail archive. There’s one for every taste! This post came about because of Amanda, my ex-boss at the BBC, who recently (and very convincingly) asked me about keeping her nails healthy and making her paint job last. This post contains samples and products I bought. Opinions are my honest own, as usual. Wow! I like your nail art and I really like the photo!! Thanks for the lovely comment and for dropping by! I am glad you like it.